El Tajín is a pre-Columbian archeological site in southern Mexico and is one of the largest and most important cities of the Classic era of Mesoamerica. A part of the Classic Veracruz culture, El Tajín flourished from 600 to 1200 C.E. and during this time numerous temples, palaces, ballcourts, and pyramids were built. From the time the city fell, in 1230, to 1785, no European seems to have known of its existence, until a government inspector chanced upon the Pyramid of the Niches. El Tajín was named a World Heritage site in 1992, due to its cultural importance and its architecture. This architecture includes the use of decorative niches and cement in forms unknown in the rest of Mesoamerica. Its best-known monument is the Pyramid of the Niches, but other important monuments include the Arroyo Group, the North and South Ballcourts and the palaces of Tajín Chico. In total there have been 20 ballcourts discovered at this site, (the last 3 being discovered in March 2013). Since the 1970s, El Tajin has been the most important archeological site in Veracruz for tourists, attracting over 650,000 visitors a year. The site is located in Mexico in the highlands of the municipality of Papantla in modern day Veracruz, not far from the city of Poza Rica, which lies northwest of the port and city of Veracruz. The city is set in the low rolling mountains that lead from the Sierra Madre Oriental to the Gulf coast near the Tecolutla River. In ancient times, this city was located in the north east corner of what is called Mesoamerica, and controlled an area from between the Cazones and Tecolutla Rivers to the modern state of Puebla. The main city is defined by two streams which merge to form the Tlahuanapa Arroyo, a tributary of the Tecolutla River. These two streams provided the population’s potable water. Most of the buildings are at the southern end, where the land is relatively flat and the two streams converge. The site extends to the northwest where terraces where constructed to place more buildings, mostly for the city’s elite. However the city also had communities located on the hills east and west of the main city, with mostly lower-class dwellings. Total site extends for 1,056 hectares (4.08 sq mi). Chronology studies at Tajín and nearby sites show that the area has been occupied at least since 5600 B.C. and show how nomadic hunters and gatherers eventually became sedentary farmers, building more complex societies prior to the rise of the city of El Tajin. The pace of this societal progression became more rapid with the rise of the neighboring Olmec civilization around 1150 B.C., although the Olmecs were never here in great numbers. It is unclear who built the city. Some argue in favor of the Totonacs and the Xapaneca; however, there is a significant amount of evidence that the area was populated by the Huastec at the time the settlement was founded. In the 1st century CE Monumental construction started soon after and by 600 CE, El Tajín was a city. 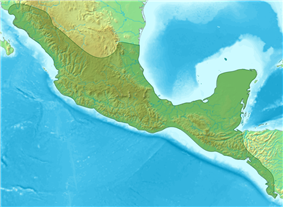 The rapid rise of Tajin was due to its strategic position along the old Mesoamerican trade routes. It controlled the flow of commodities, both exports such as vanilla and imports from other locations in what is now Mexico and Central America. From the early centuries, objects from Teotihuacan are abundant. From 600 to 1200 C.E., El Tajín was a prosperous city that eventually controlled much of what is now modern Veracruz state. The city-state was highly centralized, with the city itself having more than fifty ethnicities living there. Most of the population lived in the hills surrounding the main city, and the city obtained most of its foodstuffs from the Tecolutla, Nautla and Cazones areas. These fields not only produced staples such as corn and beans but luxury items such as cacao. One of the panels at the Pyramid of the Niches shows a ceremony being held at a cacao tree. The religion was based on the movements of the planets, the stars and the Sun and Moon, with the Mesoamerican ballgame and pulque having extremely important parts. 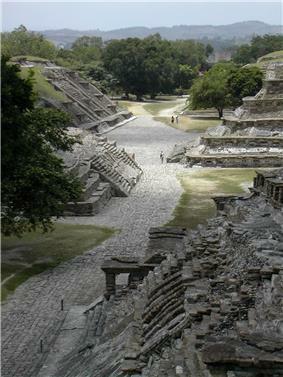 This led to the building of many pyramids with temples and seventeen ballcourts, more than any other Mesoamerican site. The city began to have extensive influence starting around this time, which can be best seen at the neighboring site of Yohualichan, whose buildings show the kinds of niches that define El Tajin. 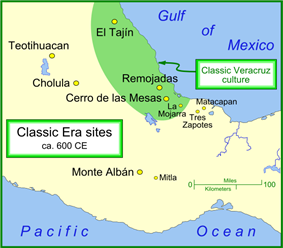 Evidence of the city’s influence can be seen along the Veracruz Gulf coast to the Maya region and into the high plateau of central Mexico. At the end of the Classic period, El Tajín survived the widespread social collapse, migrations and destructions that forced the abandonment of many population centers at the end of this period. El Tajín reached its peak after the fall of Teotihuacan, and conserved many cultural traits inherited from that civilization. It reached its apogee in the Epi-Classic (900-1100 C.E.) before suffering destruction and the encroachment of the jungle. El Tajín prospered until the early years of the 13th century, when it was destroyed by fire, presumably started by an invading force believed to be the Chichimecas. The Totonacs established the nearby settlement of Papantla after the fall of El Tajín. El Tajín was left to the jungle and remained covered and silent for over 500 years. While the city had been completely covered by jungle from its demise until the 19th century, it is unlikely that knowledge of the place was completely lost to the native peoples. Archeological evidence shows that a village existed here at the time the Spanish arrived and the area has always been considered sacred by the Totonacs. However, there are no records by any Europeans about the place prior to the late 18th century. In 1785, an official by the name of Diego Ruiz stumbled upon the Pyramid of the Niches, whilst looking for clandestine tobacco plantings breaching the royal monopoly in this isolated area rarely visited by the authorities. He made a drawing of the pyramid and reported his find to a publication called Gaceta de Mexico. He claimed the natives had kept the place secret. The publication of the pyramid’s existence in the Gaceta had an impact on academic circles in New Spain and Europe, attracting the attention of antiquarians José Antonio Alzate y Ramírez and Ciriaco Gonazlez Carvajal, who wrote about it. It also gained the interest of several academics, who compared the pyramid with the constructions of ancient Rome. The pyramid was further advertised by Italian Pietro Márquez in Europe and by Alexander von Humboldt. Its significance is due to its size and unique forms of art and architecture. The borders of the city’s residential areas have not yet been defined but is the entire site is estimated at 2,640 acres (10.7 km2). To date, only about fifty percent of the city's buildings has been excavated, revealing a series of plazas, palaces, and administrative buildings within a two-square-mile area. Unlike the highly rigid grid patterns of ancient cities in the central highlands of Mexico, the builders of El Tajin designed and aligned buildings as individual units. There are several architectural features here which are unique to the place or seen in only rarely in Mesoamerica. Adornment in the form of niches and stepped frets are omnipresent, decorating even utilitarian buttresses and platform walls. Stepped frets are seen in other parts of Mesoamerica but rarely to this extent. The use of niches is unique to El Tajin. The entrance to the site is located at the south end. In being named a World Heritage Site in 1992, new facilities have been added to this area, such as a cafeteria, information services, a park and administrative offices. The site museum is also located here. In addition, the Danza de los Voladores is enacted at the entrance to the site and is considered a requirement for visitors. The voladores appear every half hour at the pole and circle erected just outside the main gate. The site museum is divided into two parts: an enclosed building and a roofed area covering large stone sculpture fragments. The enclosed room is for smaller objects that have been found during the years the site has been explored, most coming from the Pyramid of the Niches. One of the most interesting objects on display is an altar from Building 4. It is a large stone slab sculpted to depict four individuals standing in pairs with a figure of intertwined snakes between the two pairs. The snakes represent the ball game marker called the tlaxmalacatle in Aztec times. The main exhibits of the roofed area are the fragments recovered from the Building of the Columns, with a number partially reassembled. One tells the story of 13 Rabbit, a ruler of El Tajin who probably had the building constructed. The scene shows as dual procession with 13 Rabbit seated on a wooden throne and his feet on a severed head. In front is a sacrifice victim with his entrails slung over a frame. 13 Rabbit’s name glyph appears above as well as an attendant named 4 Axe. The rest of the procession consists of warriors holding captives by their hair. This pyramid has as a number of names including, El Tajín, Pyramid of Papantla, Pyramid of the Seven Stories and the Temple of the Niches. It has become the focus of the site because of its unusual design and good state of preservation. It was prominent in ancient times as well. A large quantity of sculpture was recovered from this pyramid. The building is mostly constructed of carefully cut and crafted flagstones, the largest of which is estimated to be about eight metric tons in weight. The stones, especially around the niches are fitted together as to need a minimum amount of lime and earth mortar. The structure originally was covered in stucco which served as the base for paint. The pyramid has seven stories. Each of these consists of a sloping base wall called a talud and a vertical wall called a tablero, which was fairly common in Mesoamerica. What is unusual about this construction and others in the city are the addition of decorative niches with the top capped by what Jose Garcia Payon called a “flying cornice,” a triangular overhang. The stones are arranged in controlled lines and delicate proportions. Originally the structure was painted a dark red with the niches in black intended to deepen the shadows of the recessed niches. Niches are also found underneath the stairway along the east face, which indicates that the stairway was a later addition. The niches on the original structure, not counting those on the later stairway, total 365, the solar year. At the top of the pyramid there were tablets framed by grotesque serpent-dragons. Building B is a two story structure that was used as a residence and classified as a palace. Like other structures nearby, its roof is a thick slab of cement and there is another slab that separates the ground and upper floors. The entrance to the building from the plaza was through a divided stairway, leading to a single room 32 by 24 feet (9.8 by 7.3 m) in size. This space is broken by six stone and cement pillars which support the floor above. These columns were thickened over time as it became apparent to have stronger bracing for the weight of the two floors. The upper story is reached by narrow stairway. This floor is more spacious even though there are columns here as well. This is the only multistoried palace found outside the Mayan areas. While the Blue Temple was a fairly early construction, the pyramid next to it, Building 23 was built very late in Tajin’s history. It consists of five stories in near vertical talud without niches. The original staircase was destroyed then reworked into its present form. The divider in the center is a buttress to hold the fill behind the stairs in place. The stairs are made from a mixture of lime, sand and clay without a stone core. The interior of the building is composed of loose stone, mostly rounded river boulders. At the top, there the temple was located, is a series of stepped merlons which look like medieval European battlements. The southeast panel illustrates the opening ritual when the principal participant is elaborately dressed and is being handed a bundle of spears. This is part of an initial activity before the game itself starts. Overlooking this scene is the death deity who rises from a vat of liquid, perhaps pulque. The glyphs above the deity identify it with the planet Venus. Next is the southwest panel in which a different ceremonial preparation is depicted. The principal participant is supine on a kind of a sofa. Two musicians are playing a turtle shell drum and clay rattles. A figure dressed as an eagle dances in front while a skeletal deity flies above and the death deity rises from liquid. The northwest panel shows the beginning of the ballgame. Two participants are standing in the center of the court with speech scrolls emerging from their mouths. One holds a large knife in his left hand and gestures with his right. Between them are intertwined slashes, the symbol of the ballgame and a ball. At their waists are the protective and ritual accoutrements which are very similar to the stone yokes, palmas and hachas common in elite burials. Behind the players are two figures, one with a deer head, who are watching from the court walls as well as the death deity again above. The northeast panel indicates that the game has been played and one of the participants is about to be sacrificed by having his head cut off. The three figures are all dressed in the garments and symbols of the ballgame. The center figure has his arms held back by the one on the left. The figure on the right holds a large knife which is at the center figure’s neck. There are scrolls indicating speech from the sacrifice as well as a depiction of the skeletal god. The Cumbre Tajin is an annual artistic and cultural festival which is held at the site in March. The Cumbre Tajin is considered to be an identity festival of the Totonacs, who are considered to be the guardians of El Tajín. Events include those traditional to the Totonac culture as well as modern arts and events from cultures from as far as Tibet. Some of the events include musical concerts, experiencing a temascal, theatrical events and visiting El Tajin at night, with a total over 5,000 activities. Many of the cultural, craft and gastronomic events occur at the adjacent Parque Takilhsukut which just located just outside the archeological site. In 2008, 160,000 attended the event which featured Fito Páez, Ximena Sariñana and Los Tigres del Norte. Thirty percent of the revenue the event generates goes toward scholarships for Totonaca youth. ^ a b c Wilkerson, S. Jeffery K. (1987). El Tajin: A Guide for Visitors. pp. 72–73. ^ a b Wilkerson, S. Jeffery K. (1987). El Tajin: A Guide for Visitors. p. 12. ^ a b c Wilkerson, S. Jeffery K. (1987). El Tajin: A Guide for Visitors. p. 45. ^ a b c d e f g Schuster, Angela M. H. (1998-02-13). """El Tajín, Abode of the Dead "The Photography of Nicolas Sapieha. Archeology magazine. Retrieved 2010-02-09. ^ a b Various. 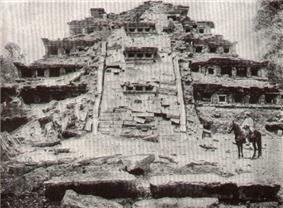 "El Tajin, Veracruz, Mexico, Ruin Site, Pyramid of the Niches". Softseattravel.com. Retrieved 2012-11-03. ^ a b c d e f g h i j "La prodigiosa ciudad de El Tajín, en Veracruz" [The extraordinary city of El Tajín, in Veracruz] (in Spanish). Mexico: Mexico Desconocido magazine. Retrieved 2010-02-09. ^ a b c d e f g h Wilkerson, S. Jeffery K. (1987). El Tajin: A Guide for Visitors. p. 10. ^ a b c d Wilkerson, S. Jeffery K. (1987). El Tajin: A Guide for Visitors. p. 16. ^ a b Wilkerson, S. Jeffery K. (1987). El Tajin: A Guide for Visitors. p. 23. ^ a b c Wilkerson, S Jeffrey K. (August 1980). "Man’s Eighty Centuries in Veracruz". National Geographic 158 (2): 214–217. ^ a b c "Esclarecen orígenes de la cultura de El Tajín" [Origins of the culture of El Tajin becoming clearer]. El Universal (in Spanish) (Mexico City). Notimex. 2007-05-24. Retrieved 2010-02-09. ^ a b Wilkerson, S. Jeffery K. (1987). El Tajin: A Guide for Visitors. p. 13. ^ a b López Luján, Leonardo. "El Tajín en el siglo xviii Dos exploraciones pioneras en Veracruz" [El Tajin in the 18th century: two pioneering explorations in Veracruz] (in Spanish). Mexico City: Arqueomex magazine. Retrieved 2010-02-09. ^ Wilkerson, S. Jeffery K. (1987). El Tajin: A Guide for Visitors. p. 14. ^ Wilkerson, S. Jeffery K. (1987). El Tajin: A Guide for Visitors. pp. 14–16. ^ Wilkerson, S. Jeffery K. (1987). El Tajin: A Guide for Visitors. p. 37. ^ Wilkerson, S. Jeffery K. (1987). El Tajin: A Guide for Visitors. p. 38. ^ a b Solís, Felipe. "El embrujo de El Tajín (Veracruz)" [The magic of El Tajín (Veracruz)] (in Spanish). Mexico: Mexico Desconocido magazine. Retrieved 2010-02-09. ^ "Los voladores de Papantla (Veracruz)" [The Voladores of Papantla] (in Spanish). Mexico: Mexico Desconocido magazine. Retrieved 2010-02-09. ^ "Parque Takilhsukut" (in Spanish). Mexico: Cumbre Tajin. Retrieved 2010-02-09. ^ Wilkerson, S. Jeffery K. (1987). El Tajin: A Guide for Visitors. p. 71. ^ a b c Wilkerson, S. Jeffery K. (1987). El Tajin: A Guide for Visitors. p. 25. ^ Wilkerson, S. Jeffery K. (1987). El Tajin: A Guide for Visitors. p. 28. ^ Wilkerson, S. Jeffery K. (1987). El Tajin: A Guide for Visitors. p. 29. ^ Wilkerson, S. Jeffery K. (1987). El Tajin: A Guide for Visitors. p. 30. ^ Wilkerson, S. Jeffery K. (1987). El Tajin: A Guide for Visitors. p. 31. ^ Wilkerson, S. Jeffery K. (1987). El Tajin: A Guide for Visitors. pp. 32–33. ^ Wilkerson, S. Jeffery K. (1987). El Tajin: A Guide for Visitors. pp. 36–37. ^ Wilkerson, S. Jeffery K. (1987). El Tajin: A Guide for Visitors. p. 36. ^ Wilkerson, S. Jeffery K. (1987). El Tajin: A Guide for Visitors. p. 39. ^ Wilkerson, S. Jeffery K. (1987). El Tajin: A Guide for Visitors. pp. 46–47. ^ a b Wilkerson, S. Jeffery K. (1987). El Tajin: A Guide for Visitors. p. 48. ^ Wilkerson, S. Jeffery K. (1987). El Tajin: A Guide for Visitors. p. 49. ^ Wilkerson, S. Jeffery K. (1987). El Tajin: A Guide for Visitors. p. 50. ^ Wilkerson, S. Jeffery K. (1987). El Tajin: A Guide for Visitors. p. 51. ^ Wilkerson, S. Jeffery K. (1987). El Tajin: A Guide for Visitors. p. 41. ^ Wilkerson, S. Jeffery K. (1987). El Tajin: A Guide for Visitors. pp. 53–55. ^ Wilkerson, S. Jeffery K. (1987). El Tajin: A Guide for Visitors. pp. 55–56. ^ Wilkerson, S. Jeffery K. (1987). El Tajin: A Guide for Visitors. p. 57. ^ Wilkerson, S. Jeffery K. (1987). El Tajin: A Guide for Visitors. pp. 58–60. ^ Wilkerson, S. Jeffery K. (1987). El Tajin: A Guide for Visitors. p. 34. ^ Wilkerson, S. Jeffery K. (1987). El Tajin: A Guide for Visitors. p. 35. ^ Wilkerson, S. Jeffery K. (1987). El Tajin: A Guide for Visitors. p. 61. ^ Wilkerson, S. Jeffery K. (1987). El Tajin: A Guide for Visitors. p. 62. ^ Wilkerson, S. Jeffery K. (1987). El Tajin: A Guide for Visitors. p. 69. ^ a b Cruz Bárcenas, Arturo (2008-03-16). "La Cumbre Tajín no dañará la ciudad sagrada, recalcan" [Cumbre Tajin will not damage the sacred city, they emphasize]. La Jornada (in Spanish) (Mexico City). Retrieved 2010-02-09. ^ "Impulsan en 'Tajín' expresión indígena" [Pushing for indigenous expression at "Tajin"]. El Siglo de Torreon (in Spanish) (Torreon, Coahuila, Mexico). Agencia Reforma. 2009-03-09. Retrieved 2010-02-09.